Form completions are a key online lead generation source for many sites. prospects and customers leave information about themselves in many ways on your website, including information on what pages they visit and where they are browsing from. When a form is completed, this is a visitor directly looking to interact with you though (or at least saying that they are happy for you to contact them). A form completion presents an opportunity to provide more value to your prospects and customers – an opportunity to drop them an email or call and encourage them to choose you (over your competitors). This behaviour should be encouraged; you want as many form completions as you can. They mean more leads and more customers. A common method for increasing form completion? Reducing the number of form fields. But wait, doesn’t that mean less information about those interested in your business? Yep. Conversion rate improves by almost half when the number of form fields are reduced from four fields to three…but you’ve obviously just lost 25% of your data too. With live chat, you can increase not just the quantity of form completions (i.e. quantity of leads) but also the quality by getting even more data. We’re about to tell you how. You’ve got a great product. You’ve got a crisply designed site which showcases it beautifully. A site visitor wants to find out more but doesn’t really know you. If a visitor hasn’t had any real interaction with you before then they may be cautious about handing over their phone number or any other sensitive information which you expect them to fill in on your form. Can you really blame them? They don’t know you. Live chat is a great trust exercise however. It’s a chance for them to dip their toe in the water and see what people behind the website are really like. Real people we hope. Having real interactions with a person helps them to establish that your company is real and trustworthy. Live chat builds trust and therefore increases willingness to hand over personal/contact information. Hey presto, more leads and maybe even a little more qualitative data about those leads (stuff you might not be able to ask for on your form). Are you going to spam your leads? I hope not. And they hope you aren’t either. But do you make it clear that that isn’t your intention? Even if your form does do this, live chat provides an opportunity for prospects to voice their concerns – and for you to be clear that you’re only taking their email to send them awesome stuff. Live chat can again be used to build trust and reassure prospects on how their sensitive information is going to be used. Imagine if a site visitor is willing to complete all but one field on your form. If someone is there to explain why this information is required then they will be more likely to go ahead and submit the form…therefore increasing form completion and online lead generation. Not only can live chat help clear up why information is being requested but it can also clear up what exactly is being asked for. Some forms can be confusing to novice computer users or people that have not used your company before. Fields such as username can be daunting if you are not sure if you are being asked for a public or private username. Even if a potential lead shows true interest in your company and is positive about being contacted with further information, the lead generation cannot properly go ahead until they have understood how to complete your form. A potential lead can easily pop on to live chat and find out what your form is asking for if they are a little confused but still want to make direct contact with you. Live chat can be used to offer support to your potential leads and customers if they become stuck on any page of your site. Form completion could also be totally done away with on your site thanks to the implementation of live chat. Online lead generation and qualification is a strong capability of live chat, when it has the proper strategy behind it. If the correct people are invited to chat then site visitors which show promise can then be generated as leads through an engaging conversation with a live chat agent. This live chat conversation can also be used to qualify the lead in real time. This is because potential customers will be willing to reveal a little more information about themselves and their company through a live chat conversation with a professional and friendly agent rather than they would through a robotic form completion. 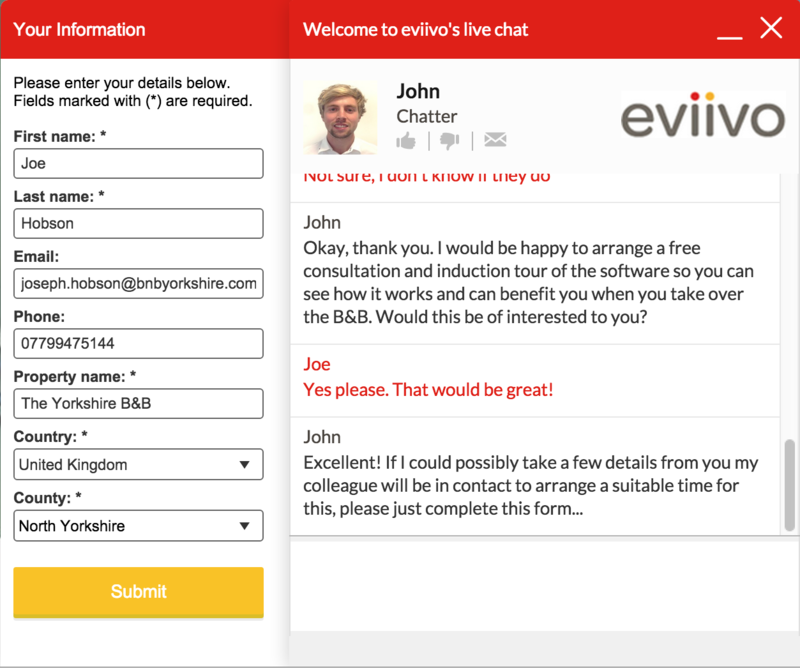 And, even better, a form can quite literally be incorporated into live chat with the right coding abilities. Looking to improve your online lead generation? Find out how we can help you generate 50% more leads from existing traffic.